Ancient and medieval cultures typically attach great significance to a name. In plenty of magic systems, knowing the name of a thing grants a person tremendous power over it. Think of Patrick Rothfuss’ major hit THE NAME OF THE WIND. I won’t spoil it for your readers, but let’s just say that the title gives some indicators as to what’s going with the magic system and its relationship to names. Andre Norton’s WITCH WORLD books worked the same way: to know the name of a thing is, in part, to own it. That’s a perfectly fine way to pick a name, but it doesn’t exactly scream “brimming with magical significance.” My SHADOW OPS series is a modern fantasy, and it’s important to me that it resonate/extrapolate realistically with the modern world. Part of that means following the naming conventions of my time and setting (modern America). Of course, I try to choose names that resonate and stand out, but in the end my characters’ parents named them like most modern people do: after a beloved relative or personal hero, or because they simply always liked the sound of it. I also draw heavily on my experiences working in/around the military, and there are names there that have impressed me (attached to people that impressed me), and sometimes pulling an element from those names is a small way to honor them. I do have one advantage: in the SHADOW OPS universe, military Sorcerers typically receive “call signs” (much like military aviators). While peoples names may not be tied to the aspect of their lives most pregnant with drama (their magical abilities), their call signs most certainly are, and that gave me the opportunity to play around in that way that makes fantasy writing so much fun. Why is Oscar Britton known as “Keystone?” Why is his dedicated enemy, an army Aeromancer, known as “Harlequin?” I even have those “Selfers” who refuse to join the army and use magic on their own give themselves noms de guerre their own call signs that mock the military who pursues them. Swift, Scylla, Peapod, Wavesign. All of these are attached to something, born of attributes and experiences that shape what makes that character different, that shows their vision for how they plan to exist in a world changed permanently by magic. It has a lot in common with the way comic book superheroes are named. Myke Cole on Facebook, Twitter, Website. I should be finishing up Shadow Ops: Control Point soon (am currently about halfway through) so look out for a review of it in the coming days. I’ll be sure to include a commentary on the naming patterns within the book as part of the review. The next contributor to the series will be friend and author Chris F. Holm, on the 27th September A full schedule of guest posts can be found here. 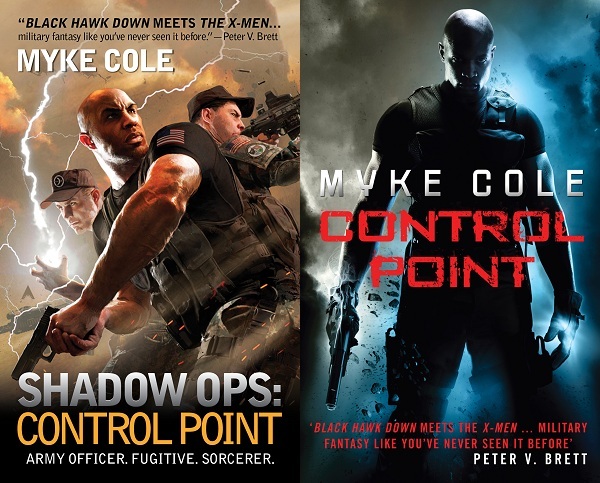 Posted on September 24, 2012, in Debut Authors Guest Series, Guest Posts and tagged Control Point, Debut Authors Guest Series, Fortress Frontier, Myke Cole, Names, Names A New Perspective, Oscar Britton, Shadow Ops, The meaning of Names. Bookmark the permalink. 6 Comments. Thanks Myke. The Call Signs definitely gave an extra level of authentic feel to the novel. I know us civilians mainly think of call signs for fighter pilot jocks in the real world. However, that resonates with the theme of the novel in that that helps reinforce sorcerers in the military as being individuals who need to harness their talents for the good of the squad and the Army.